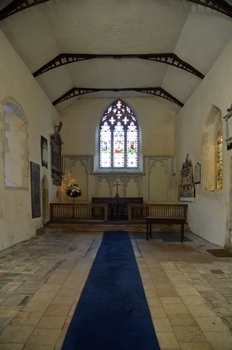 I had to make two trips in a day to the vet at Copdock to drop off and pick up my rabbit (thankfully nowhere near the scene of my Copdock church experience), and I thought this time I would finally visit Hintlesham church, which I had driven past countless times. My failure to do stop on any previous occasion had been caused, first, by the fact I hadn’t spotted anywhere to park (I should have looked right instead of left), and later by my experiences at Copdock and Bentley: I had been left with the impression that many churches in the vicinity of Ipswich kept their doors firmly locked to visitors. I planned to visit in the afternoon, but decided to check if it was open on my way home in the morning, fully expecting it not to be. A sign in the porch stating, ‘this church is locked at night,’ raised my hopes, but it was not until I turned the door handle that I fully believed what the sign implied. I couldn’t resist a look inside, but I didn’t explore too thoroughly, wanting to leave the pleasure until later. 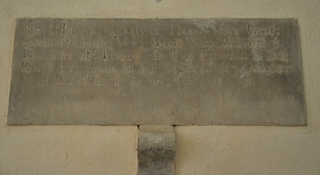 When I got home, I checked my map for other churches nearby, and found that Burstall was also kept open during the day. After my previous outing, I was especially happy with the prospect of getting inside two churches that afternoon without wasting any time on locked doors. 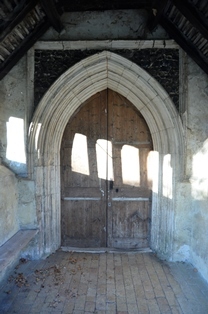 I was delighted beyond reason that Hintlesham church was accessible, and felt vindicated in my objection to locked churches, regardless of their location. 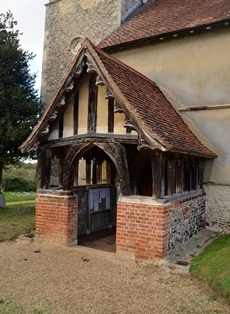 According to Simon Knott, Ipswich town churches are actually kept open, so it seems a bizarre contradiction to me that those nearby should not be. 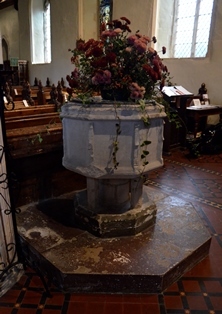 What I had glimpsed inside Hintlesham church only increased my anticipation. 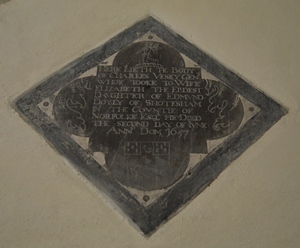 Not only was I surprised by the open door, but also by the old and rural interior of the church. 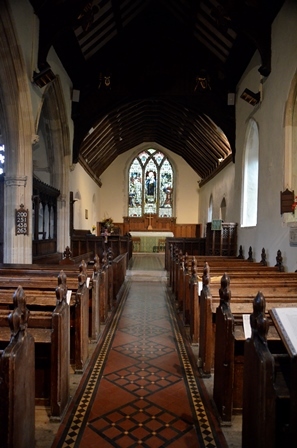 The Victorians were refreshingly gentle on Hintlesham church and the old brick and pamment floor and large empty chancel were very much to my liking. It wasn’t as light as some, but the afternoon sun was in a direct line with the south windows and the light was atmospheric. 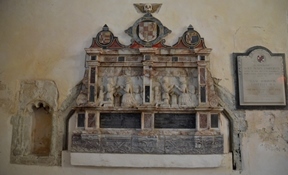 In the chancel there were numerous 17th century memorials, all different, and attractive even to me, the ‘memorial indifferent’. 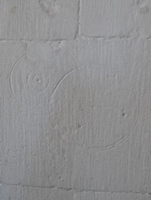 I saw in the visitors’ book that a medieval graffiti survey group had visited, so I looked around for graffiti, finding crosses, daisy wheels, initials and a few unusual carvings that I didn’t recognise. 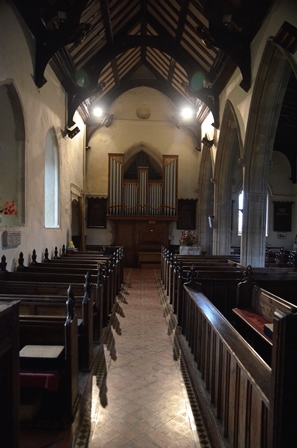 Needless to say, the chancel was my chosen playing location. The sound of traffic was prominent, but I couldn’t have been less bothered by it, so pleased was I with my surroundings. 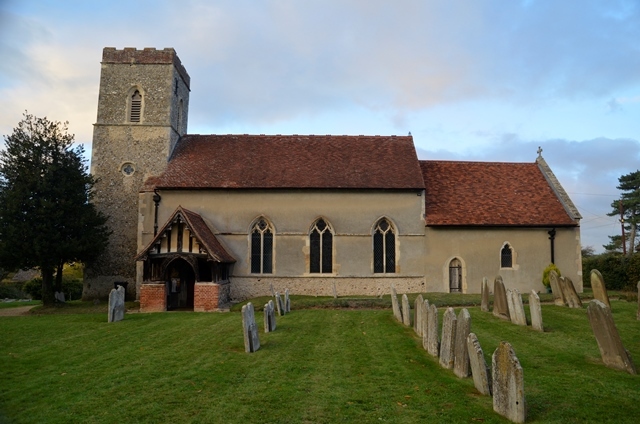 Before I moved to Suffolk, the name Hintlesham had only one vague association for me, and it was an unusually bad one for this mostly peaceful county: over ten years ago, several bodies of women murdered by an Ipswich man were found near there. Of course, this didn’t particularly colour my view of Hintlesham once I became acquainted with the village, especially as the murderer didn’t live there, and the murders almost certainly didn’t take place there. In reality it is no worse than much of the historical violence that took place around the county in the Middle Ages and beyond; it is only because of its recentness that it is so shocking. But it was always at the back of my mind when I drove past the village sign. 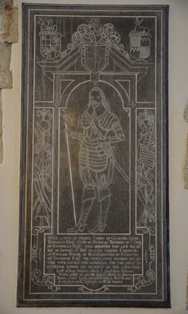 Now I have a new, thoroughly good image of Hintlesham to lay decisively over the old one. 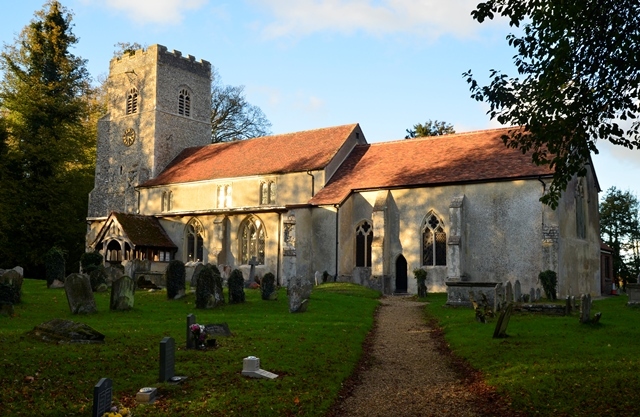 Burstall church was even closer to Ipswich, but off the main road beyond Hintlesham, with a cosy village feel and a row of cottages opposite the church. 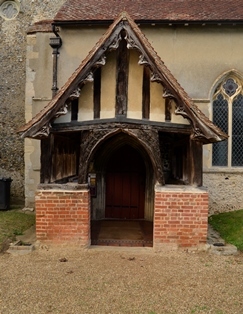 The entrance porch was on the side facing away from the road, which seemed a pity, because it was beautiful. I’m sure more passers-by would be enticed inside if they caught sight of such a porch. 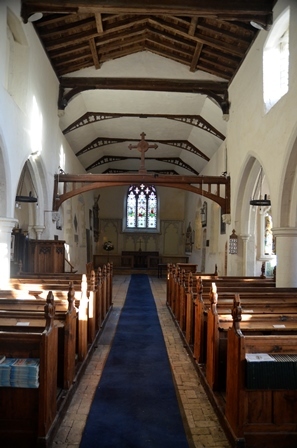 The interior was much smaller, more Victorian, and darker than Hintlesham church. With the clocks recently changed back to Greenwich Mean Time, it was getting ‘late’ in the afternoon, undoubtedly contributing to the dim interior. 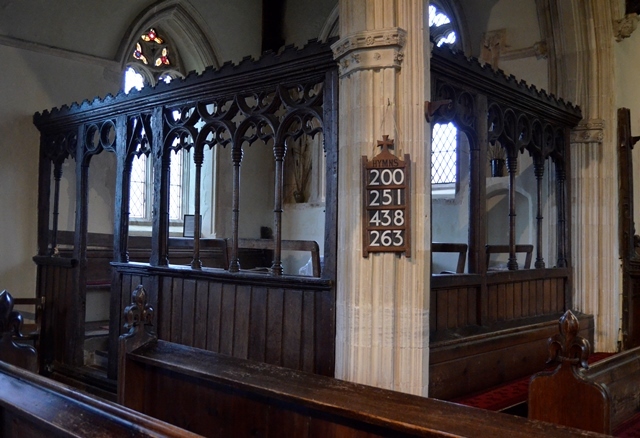 The parclose screen was in pristine condition, and I had to look it up afterwards to find out that it was, astoundingly, the original early 14th century screen rather than a Victorian reconstruction. 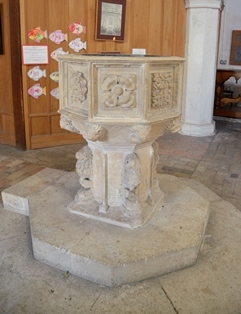 The font was clearly old, however, and I enjoyed its slightly battered appearance amongst the otherwise neat and tidy interior. 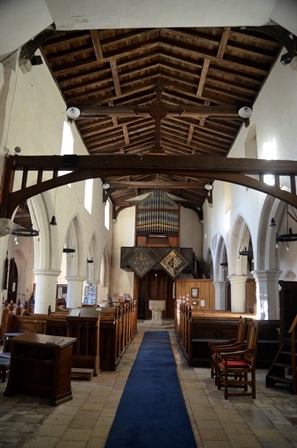 I didn’t have very much time to practice here before I had to be back at the vet, having stayed longer than I intended at Hintlesham, but I felt my time had been divided appropriately: I preferred the interior of Hintlesham and the exterior of Burstall, and I was glad to get outside again to see the last of the afternoon sunshine.